In this paper, we report a systematic investigation of band-edge photoluminescence for Cd1-xMn x Te crystals grown by the vertical Bridgman method. The near-band-edge emissions of neutral acceptor-bound excitons (labeled as L1) were systematically investigated as a function of temperature and of alloy composition. The parameters that describe the temperature variation of the energy were evaluated by the semiempirical Varshni relation. From the temperature dependence of the full width at half maximum of the L1 emission line, the broadening factors Γ(T) were determined from the fit to the data. 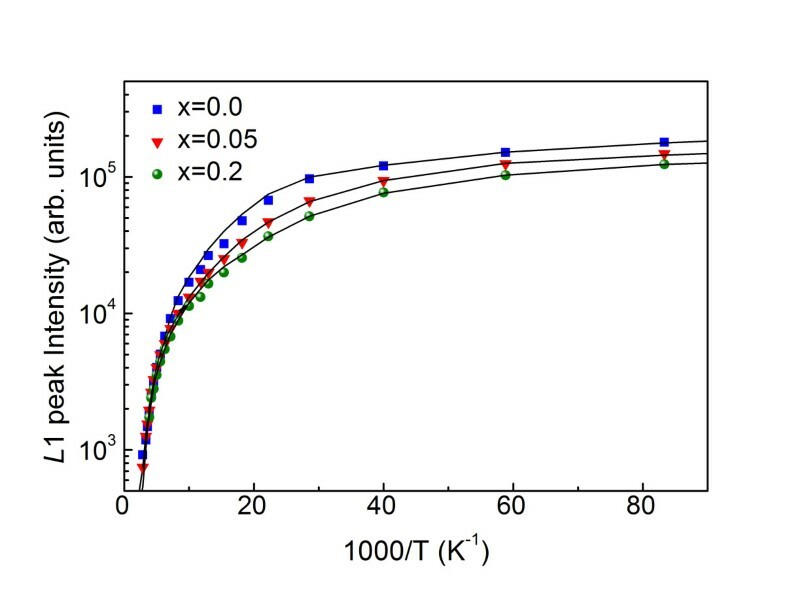 The activation energies of thermal quenching were obtained for the L1 peak from the temperature dependence of the bound exciton peaks and were found to decrease with increasing Mn concentration. Diluted magnetic semiconductors [DMSs] are semiconductor alloys formed by randomly replacing a fraction of the cations in a compound semiconductor with magnetic ions, e.g., Mn2+ in CdTe to form Cd1-xMn x Te . The presence of the magnetic ions leads to a number of unusual electronic, optical, and magneto-optical properties, including the ability to magnetically tune the band gap made possible in this material by the large sp-d exchange interaction between magnetic ions and band electrons . These properties make Cd1-xMn x Te [CMT] promising candidates for fabricating magneto-optical devices, such as Faraday rotators, isolators, magneto-optical switches, and solar cells . Recently, CMT has attracted much interest as a potential material for applications in the gamma-ray detectors because of a wide band gap and high resistivity . The bulk CMT crystals have been grown with different growth methods, such as vertical gradient freeze, traveling heater, and vertical Bridgman method. Among these, the vertical Bridgman technique can be widely used successfully to grow CMT bulk crystals. The CMT crystals fabricated by this method showed zinc-blende structures for x < 0.77 . Photoluminescence [PL] is a useful technique that has been employed to characterize bulk materials . This technique has been used to study the near-band-edge excitonic states and structural quality in materials. In particular, the temperature dependence of PL spectrum intensity has been used to obtain information about electronic gap levels in semiconductors. In this work, we present the PL study on the CMT bulk crystals grown by the vertical Bridgman method to investigate the variation of the band-edge transition energy in the PL spectra as a function of Mn composition x and temperature. In addition, the measurements made it possible to analyze and discuss in detail the broadening mechanisms of the exciton emission lines and their dependence on both the Mn content and temperature. CMT crystals were grown by using the vertical Bridgman method from Cd(6N), Te(6N), and Mn(4N) elements. The elements were vacuum-sealed in a carbon-coated quartz ampule under a pressure of 1 × 10-6 Torr. The reaction temperature was slowly raised from 600°C to 1,200°C. The ampule was held at 1,200°C for 3 h to homogenize the melt and lowered at a rate of 1.44 mm/h. 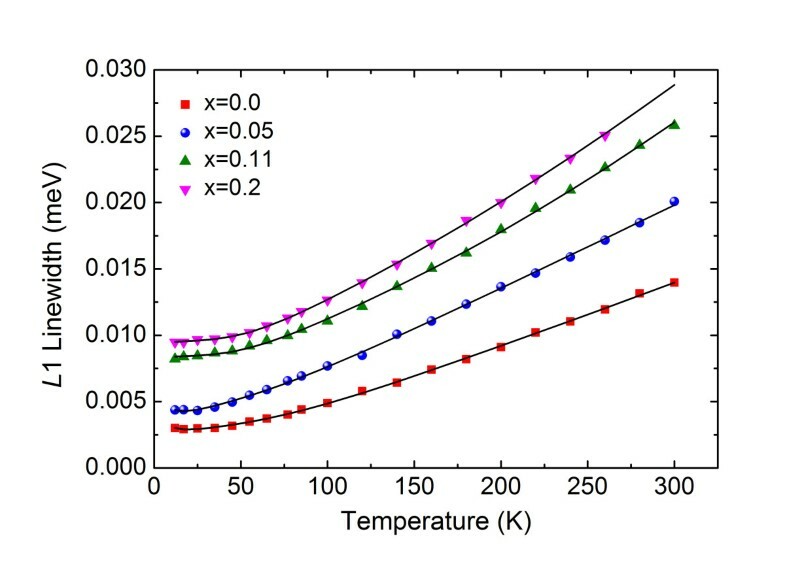 The solidification gradient in the furnace was 22.5°C/cm. The crystal obtained was of cylindrical form of 10 mm in diameter and 20 mm long. The mole fraction x was determined by an electron probe microanalyzer (EPMA-1400; Shimadzu Corporation, Nakagyo-ku, Kyoto, Japan). Before PL measurements, CMT samples were cut into 5 × 5 × 1 mm3, mechanically polished, and then etched in 2% bromine-methanol solution. In order to measure the PL spectra, the samples were cooled down to 12 K in a cryogenic system and excited by a 442-nm line of a He-Cd laser (Liconix 4240NB; Sunnyvale, CA, USA). The luminescence was detected by a photomultiplier tube using a grating monochromator and analyzed by a computer-aided data acquisition system. Figure 1 shows the PL spectra at 12 K and 300 K taken on the CMT crystals for Mn concentration from x = 0.0 to 0.2. In DMSs, the strong sp-d exchange interaction between carriers and localized magnetic ions gives rise to the formation of a magnetic polaron and causes an energy shift as a result. However, we only considered the behavior of the exciton peak with temperature and composition without taking the formation of a magnetic polaron into account because our temperature was slightly high to show the bound magnetic polaron in the PL spectra, and there was no applied magnetic field. The PL spectra are dominated by exciton peaks, i.e., there is no noticeable luminescence associated with self-activated or other deep centers. The band-edge emission peaks of a CdTe crystal are similar to those found in the PL spectra reported by other investigators [6, 7], and it will therefore be convenient to use our results for CdTe as a point of departure. Photoluminescence spectra observed at 12 K. The spectra was observed for a series of CMT crystals with different Mn concentrations x. The inset displays typical PL spectra at 300 K.
The inset of Figure 1 shows the PL spectra for CMT with different Mn mole fractions at 300 K. The line shapes of the spectra taken at 300 K consist of a single band which corresponds to transitions across the band gap. The intense PL emission at 300 K in CdTe reflects that the samples are high quality crystals. The dominant emission peak observed for CdTe at 1.590 eV is attributed to neutral acceptor-bound exciton transitions (labeled L1). This acceptor bound exciton feature dominates in the PL spectrum observed from a range of grown CdTe samples which are usually p-type . We ascribe the weaker higher-energy feature at 1.594 eV associated with bound exciton recombination about shallow donors (labeled L2) . The spectra also show a weak luminescence peak at about 1.575 eV, which is identified as the first longitudinal-optical [LO]-phonon replica (designated as A) of the free exciton transition . The spectra also show weak luminescence peaks at about 1.555 and 1.534 eV, which we interpreted to be the second and third LO-phonon replicas (designated as B and C) of the free exciton . The general features of the CdTe PL spectra are also seen for the CMT crystals. However, for x > 0, the L1 and L2 luminescence lines begin to overlap and can no longer be resolved because of the increase of line broadening which accompanies the increase of x. 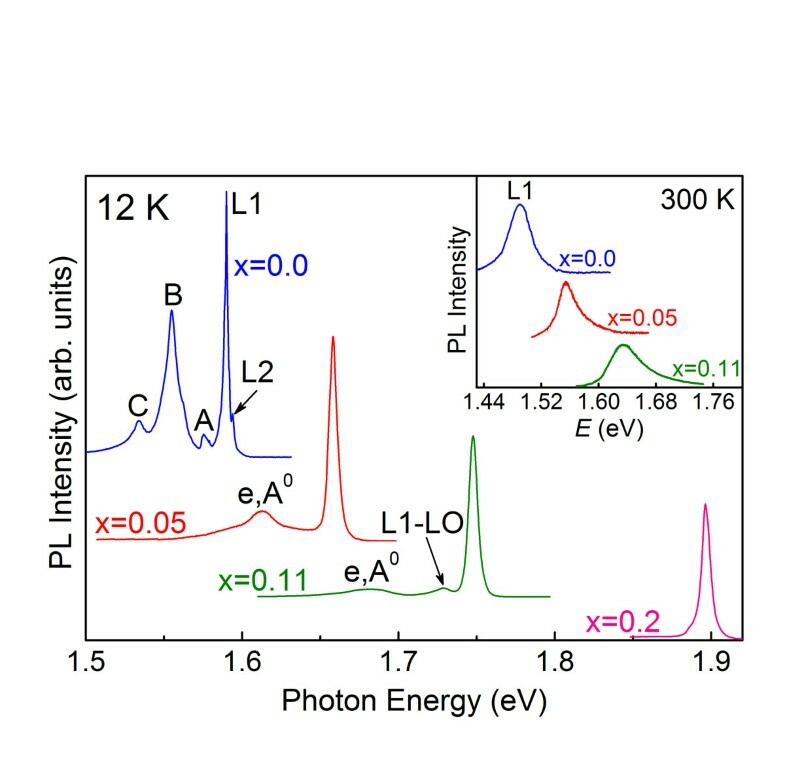 The main emission peaks at the highest energy are believed to be due to the acceptor bound exciton (L1). The weak peak at slightly lower energies, 1.612 and 1.681 eV for x = 0.05 and 0.11 in Figure 1 has been attributed to the electron-to-neutral acceptor transitions (e, A0). The energy separation between L1 and (e, A0) increases from 46 to 66 meV upon increasing x from 0.05 to 0.11, which is larger than the separation of 41 meV for CdTe . In addition, the peak at 1.728 eV for x = 0.11 is the LO-phonon replica of the L1 transition giving a LO phonon energy of 21 meV in agreement with the published value of 21.4 meV . The L1 peaks (as well as L2 when they are resolved) are blue shifted with increasing Mn mole fraction x. According to Lautenschlager et al. , this blueshift is responsible to the decrease of lattice constant, which is not strongly affected by the admixture of Mn 3d states. As the incorporation of Mn atoms increases, the band-edge luminescence peak becomes broader and weaker. 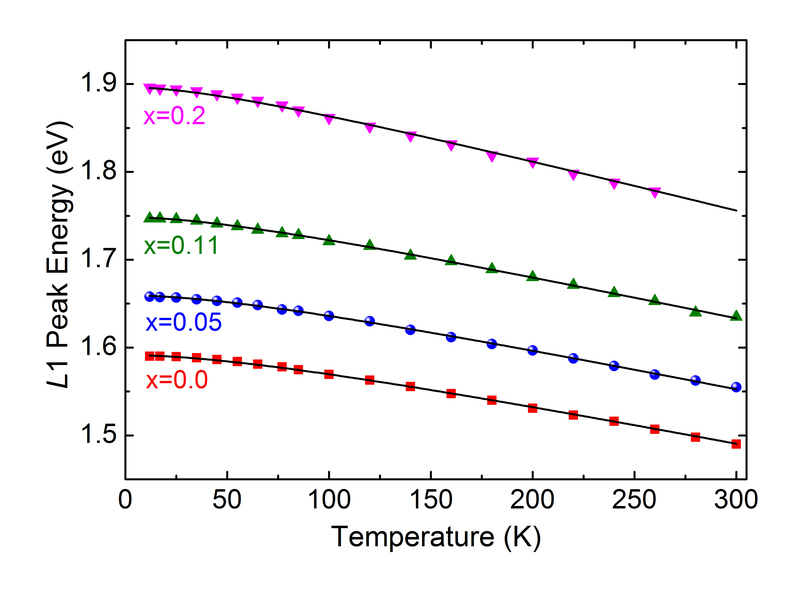 Temperature dependence of the neutral acceptor-bound exciton peak L1 for a series of Mn concentrations. The solid lines are the fits according to the Varshni relation (Equation 1). where E0(0) is the transition energy at T = 0 K, and α and β are constants referred to as Varshni thermal coefficients. The parameter values of α and β obtained by fits to our E0(T) data with Equation 1 are listed in Table 1. The parameter α is seen to increase linearly with x. The change of the band-gap energy Eg with temperature is usually attributed to the effect of electrons or phonons. The electron-hole pair is believed to soften the lattice vibration of the crystal when it is excited across a band gap . This change in lattice vibration frequency can also occur when carriers are bound to vacancies or when impurities are excited. The increase in the temperature parameter α with increasing x in CMT indicates that the crystal is undergoing changes in the lattice vibration frequency as the Mn content increases in the alloy lattice. One can argue that the introduction of Mn into the CdTe lattice leads to the formation of vacancy (acceptor, donor) sites on which electrons or holes can be trapped. The presence of a trapped carrier reduces the interatomic force constant at or around the vacancy site, thus softening the normal-mode frequencies of the lattice and reducing the zero-point energy of the oscillators. An increase in the number of Mn atoms in the lattice seems to lead to an increase in the effective mass of the bound trap complex, and thus to an increase in mode softening . This fact agrees with the observed increase in the parameter α with increasing x in Zn1-xMn x Se . The decrease of β seen in Table 1 is another feature characteristic of Mn-based DMS alloys . It is well known that in a semiconductor, when the temperature is much below the Debye temperature, a T2 dependence of the energy gap is observed, a behavior which led Varshni to propose a relation between the parameter β in Equation 1 and Debye temperature θD . In Mn-based DMSs the Debye temperature does not change with increasing Mn concentrations . We therefore believe that there is an additional factor which increases the gap. Alexander et al. analyzed this phenomenon as being due to the shift of the conduction band energy resulting from the exchange interaction between the magnetic ions and conduction electrons. We are thus inclined to conclude that the decrease in β with x is connected with a smooth shift of the conduction-band energy . Temperature dependence of the FWHM of L1 emission lines for a series of Mn concentrations. where Γinh is the inhomogeneous broadening term, γLA is a coefficient of exciton-acoustic phonon interaction, ΓLO is the exciton-LO phonon coupling constant, ħωLO is the LO phonon energy, Γi is a proportionality factor which accounts for the concentration of impurity centers, and Ei is the binding energy of impurity-bound excitons averaged over all possible locations of the impurities. The solid lines in Figure 3 are drawn by fitting Equation 2 to the experiment data. In the case of CdTe, the fitted values are Γinh = 1.15 meV, ΓLO = 25.6 meV, ħωLO = 20.9 meV, and γLA = 4.9 × 10-6 meV. It is noted here that the contribution of the impurity scattering process to the linewidth broadening can be neglected. The value for ħωLO is in good agreement with the LO phonon energy of 21.3 meV in CdTe . Listed in Table 2 are the obtained values of Γinh, ΓLO, ħωLO, and γLA for the Cd1-xMn x Te crystals. We noted that the effect of γLA is smaller than that of any other broadening term for each composition x, indicating that the effect of exciton-acoustic phonon interaction on the linewidth is negligible. It is noted that Γinh and ΓLO increase with increasing x, while ħωLO is nearly constant. It is well known that ΓLO should increase with the polarity of the material and that the inhomogeneous broadening in Γinh may be accounted for implicitly and partly by the presence of various site symmetries of the Mn2+ ion in the lattice, the existence of stacking faults , and the presence of impurity complexes involving lattice vacancies . Parameters on 풢inh, 풢LO, ħωLO, and γLA as a function of Mn concentration x were obtained by fitting Equation 2 to the data shown in Figure 3. Also listed are the obtained values of E1 and E2, obtained by fitting Equation 3 to the data shown in Figure 4. The emission intensity of the neutral acceptor-bound exciton line L1. The emission intensity is a function of reciprocal temperature for a series of Mn concentrations x.
where E1 and E2 are the high- and low-temperature activation energies, respectively. For CdTe, the values of the parameters obtained from the fit to Equation 3 are E1 = 5.9 meV and E2 = 14.3 meV. These values are in fairly good agreement with the reported exciton binding energies for the L1 line . Listed in Table 2 are the behaviors of activation energies as a function of Mn mole fraction x. The activation energy is seen to decrease with increasing Mn concentration, similar to the results reported by Su et al. . This behavior has been interpreted in terms of the four-center model suggested by Fonger  and observed in many ternary alloys [27, 28]. The PL characteristics of the diluted magnetic semiconductor alloy CMT crystals were systematically studied as a function of temperature and Mn concentrations. Bulk crystals were grown by the vertical Bridgman method for Mn concentrations from x = 0.0 to 0.2. Our studies involved near-band-edge excitonic PL emission of neutral acceptor-bound excitons with emphasis on the dependence of the PL spectrum on temperature and alloy composition. With increasing x, the Varshni parameter α increased while β decreased. From the temperature dependence of the FWHM of the L1 emission line, the broadening factors were determined by fitting Equation 2 to the data. From the temperature dependence of L1 we were able to determine the activation energies for thermal quenching of the corresponding bound excitons. Our results showed that the values of activation energies decrease with increasing Mn concentration x. This work was supported by the Nuclear R&D program (2010-0026181) and the Priority Research Centers Program (2009-0093818) through the National Research Foundation of Korea (NRF), funded by the Ministry of Education, Science, and Technology. YH carried out the CdMnTe crystal growth and wrote this manuscript. YU participated in the design of this research and performed the data analysis. HP participated in the measurement of photoluminescence and analysis. All authors read and approved the final manuscript.